Review of Unibroue Chambly Noire | Beer Apprentice - Craft Beer News, Reviews, Interviews and Info. Hello again. It’s time for another craft beer review and today I’m going to be trying the Chambly Noire produced by the Unibroue Brewery located in Chambly, Quebec, Canada. It’s been forever since I last had this brew and I don’t really remember much about it, so this will be a nice opportunity for me to revisit a beer that helped introduce me to craft beer. 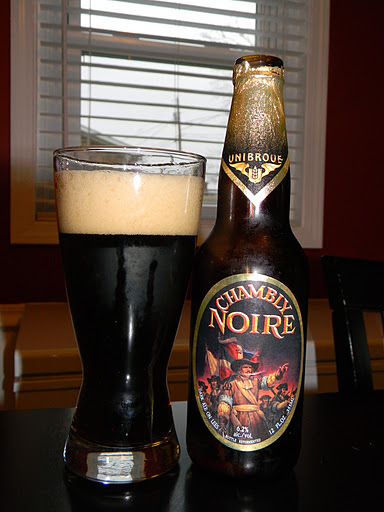 Let’s jump to the website, unibroue.com, and see what kind of information we can find about the Chambly Noire. This dark ale was created in honor of the brave soldiers of the Carignan-Salières Regiment, with their famous black musketeer hats. In 1665, King Louis XIV sent the regiment to New France to defend against the Iroquois. He had a number of strategic forts, including Fort Chambly, built along the Richelieu River, ensuring peace and prosperity for the colony. Many French Canadians are the direct descendants of these intrepid forebears. This Unibroue effort has an ABV of 6.2% and it comes in a 12 oz. bottle. The pour revealed a color of dark brown to burgundy with some burnt orange highlights at the edges of the glass. The head was khaki colored, mostly smooth, but kind of fizzy. The size was good on the initial pour, but it started to dissipate a little quicker than I had hoped. The lacing left behind looked decent enough though. The aroma exposed scents of deep, dark cherries, grapes and apples. An evidence of spice in the form of clove and coriander merged well with hints of toasted wheat bread and dried yeast. Once the brew warmed a tad, the cherry notes started to come forth a little stronger to give it a slight red wine bouquet. Overall, not bad on the nose. The flavor seemed to let the fruitiness of the apples and grapes be exposed a bit more along with a relish of dried plums. It tasted a little like a combinations of apple and grape juice to be honest. It was sweet, but the spices seemed to be a bit more gentle and moderate. Further implications of some breadiness along with a yeasty and grainy aspect gave the taste a solid foundation. Little to no bitterness was noticed and I found no trace of alcohol either. The taste was well balanced and proper, although just a touch mild. The mouthfeel was medium to thin bodied. It was incredibly smooth, decently dry and somewhat crisp. Only an ok amount of flavor was left covering the palate after each sip. No alcohol warmth was noticed with this one. Well…. this was an “ok” beer I thought. It was nothing outstanding or overly complex, but rather a very enjoyable and easy going drink. Kind of a middle of the road beer. A decent aroma and flavor to ponder over. The ease of drinkability was a plus while sampling this brew too. I worked my way through the bottle fairly quickly. I’d say give it a try if you have not done so yet. The Unibroue Brewery is not going to lead you astray. Chambly Noire would pair well with those cooler days and nights of Summer and Fall I believe. So pick up a bottle the next time you see it and let me know what you thought of it. Now…. don’t expect a “world class” beer, but instead expect a suitable, well harmonized beer that could be enjoyed by any range of craft beer drinker. Thanks for reading and commenting guys. Be sure to check back from time to time. Also, if you have any suggestions or criticisms don’t be afraid to voice them. I’m always looking for tips to make the blog better.